Join us for $2 make n take projects! We'll have some fun card making sessions, heat vinyl decal pillows, & sew much more! Each make n take will be $2 over and above your seat. This class is for everyone! Not just Brother sewing enthusiasts. It's for the Crafters too!! What is New With Brother? Join us to welcome our Brother Educator, Lynn Swanson as she introduces and demonstrates the many new and exciting 2018 Brother products. Imagine being able to project your embroidery design or stitches onto fabric before you stitch, or use a laser grid light to ensure your decorate stitches are straight and even! See this and all the other exciting industry first features of the new Luminaire XP! and the ScanNCut DX225. 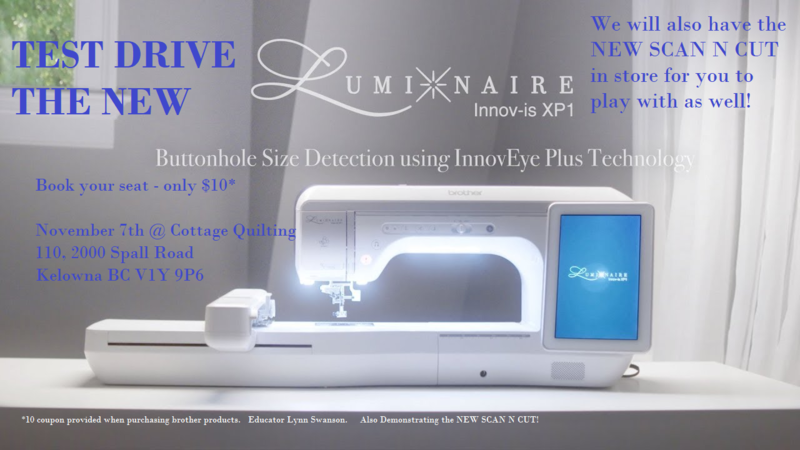 Get a first look at the new Luminaire XP1 with industry first features and technology, sneak a peak at the new ScanNCut DX225, digital cutter & learn about the new ‘user friendly’ features of PE Design 11. So much to talk about, learn about and see! *$10 will be returned as a credit towards Brother products when you attend the class one of the sessions. We will have a variety of make n take projects for $2 each. Please confirm your name & makentake when registering so we have enough kits for everyone.